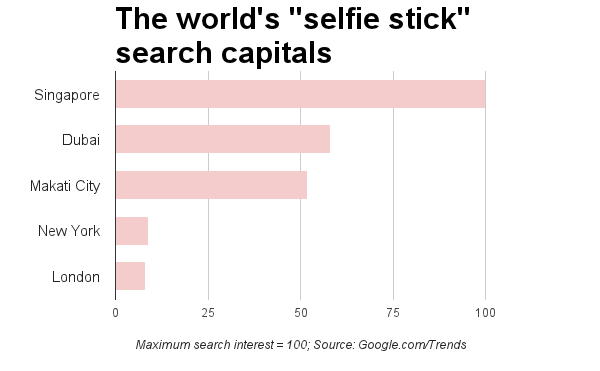 Search behavior picked up by Google Trends revealed that Southeast Asian countries may have kicked-off the online popularity of cameras on a stick, more commonly known as selfie sticks. The volume of online queries for ‘selfie stick’ and ‘monopod’ globally started to pick up late 2013 in Indonesia, with activity roughly seven times more than the US. It soon spread to Malaysia where it rapidly doubled Indonesia’s record between January and March. 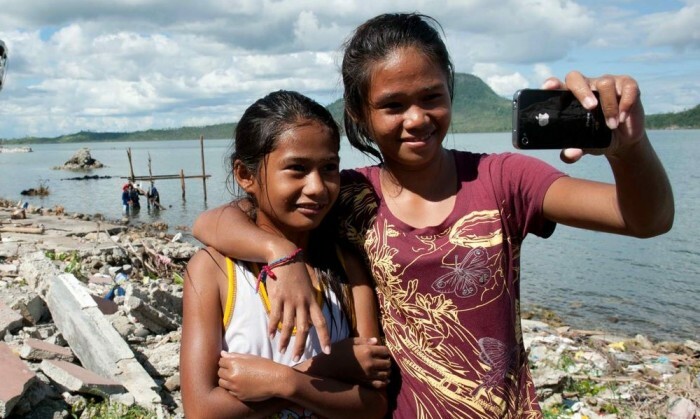 Philippines, Time magazine’s Selfie Capital of the World, overtook Malaysia shorty, doubling the search interests recorded in that country between March and June to also become the selfie stick capital of the world in that period. 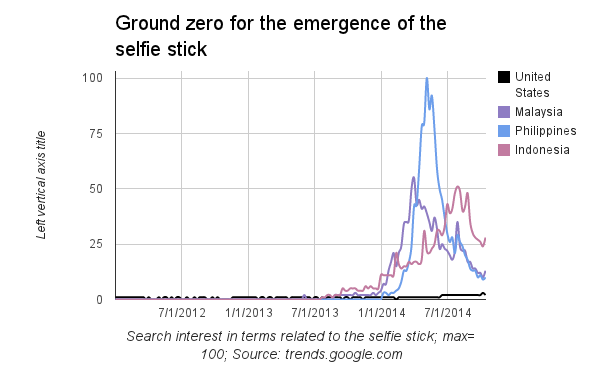 Google figured that the popularity of selfie sticks began a year earlier in 2012 alongside the booming rise of selfies in pop culture. Contrary to claims that the uptrend began in the US, a separate online study conducted by Google on the history of people’s interest on selfies confirmed that it actually first gained traction in Asia two years ago. For instance the Japanese term for selfie in 2012 was more than 50 times more searched than US’ ‘selfie’ while Taiwanese, Korean and Chinese equivalents were also far more searched than its western counterpart. To date, Google says that Singapore showed the high interests on the modern arm extenders as the selfie capital of the world, followed by Dubai who has overtaken both Indonesia and Philippines. 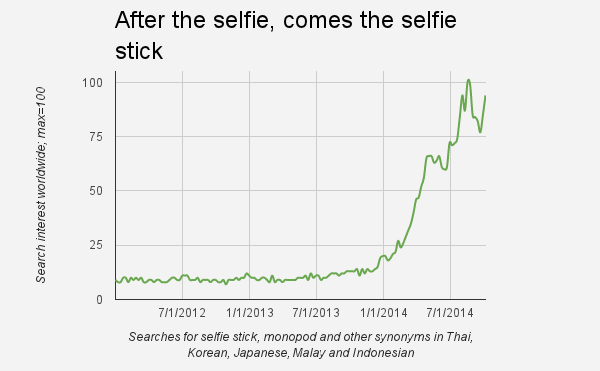 Selfie sticks are now marching north of Asia. 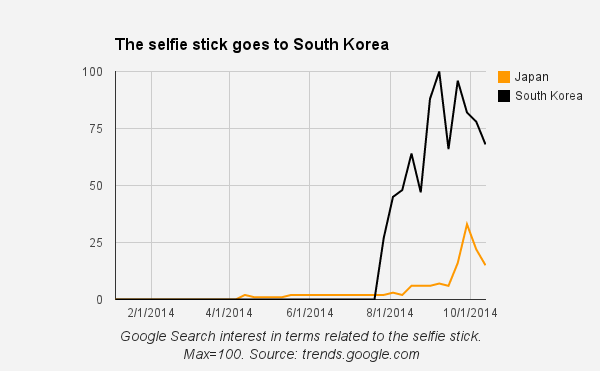 Since August this year, online searches on ‘selfie stick’ peaked in Japan and South Korea, with Korea showing the bigger spike. From the early cameras to smartphones and to photography enabling tools like tripods and now selfie sticks, people continuously find ways to better represent themselves in a community that has evolved into digital natives,” said Gail Tan, Google Philippines Head of Communications. “Almost everything now seems to find meaning in the four corners of digital photography. The figures we gathered on selfie sticks provide a portrait on how the act of capturing ourselves visually as a way to communicate is continuously evolving,” she adds. The Philippines ranks first regionally and third globally as home to the world’s most confident consumers in the third quarter of ..